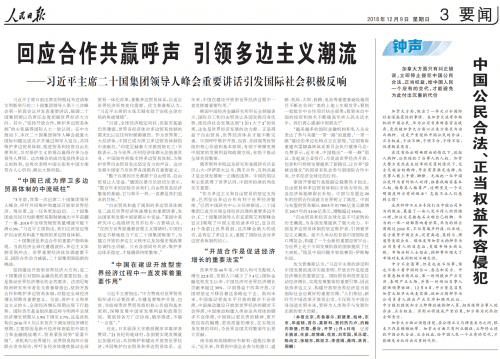 In a page three editorial in the Party’s official People’s Daily newspaper today, China’s leadership makes the sternness of its position known in regard to the arrest in Canada of Huawei CFO Meng Wanzhou (孟晚舟), the daughter of the company’s founder. The commentary is attributed to “Zhong Sheng” (钟声), a pen name used in the paper since November 2008 for important pieces on international affairs on which the leadership wishes to register its view. The name “Zhong Sheng,” literally “bell tone,” is a shortened version of “bell tone to warn the world,” or jingshi zhongsheng (警世钟声). Particularly of note in this commentary is the way it conflates arguments about the rights and dignity of Meng Wanzhou — even throwing in the term “human rights” — with an argument about the stature of the company Huawei. It mentions the fall in U.S. stocks that followed the arrest, as if to suggest that legal process should simply be suspended in such a case, or that Huawei is above the law. But it is clear from the piece that the Chinese leadership, at least publicly, does not view this as a legal case at all, but purely as a political move on the part of the United States and Canada. The threats to Canada are unambiguous: dire consequences follow unless they relent and release Meng immediately. The only way to avoid paying a much heavier price is for the Canadian side to correct this error, immediately desisting from this violation of the legal and reasonable rights of the Chinese citizen, giving the Chinese people the explanation they deserve. The Canadian side has done something sufficient to make the international community feel deep astonishment. A Chinese citizen who was transferring flights in Vancouver, Canada, Huawei Chief Financial Officer Meng Wanzhou, was suddenly arrested by the Canadian side at the request of the American side. This is a serious violation of the legal and reasonable rights of a Chinese citizen. The methods are unacceptable, the justifications unreasonable, and it is unacceptable and of a most vile nature. To arrest someone without offering a clear reason is an undisguised infringement upon the human rights of that person. The Canadian side, even though there had not been a trial and determination of guilt, went entirely against the spirit of the law, choosing to infer guilt and placing the person in handcuffs and fetters. To treat a Chinese citizen like a serious criminal, to roughly trample their basic human rights, and to dishonour their dignity, how is this the method of a civilised country? How can this not make people furious? The various illegitimate methods employed to attack the Chinese company Huawei have exposed the dark psychology of certain shameful people, but it will ultimately be a stone dropped onto their own feet. With its every movement, Huawei influences the world. Huawei’s suppliers number over 2,000, and include not just AAC Technologies Holdings, BYD Company, Foxconn and other Chinese enterprises, but also Qualcomm, Intel, Broadcom and other American companies. After media reported that Canada had arrested the Huawei executive, the U.S. stock market fell across the board. Market analysts said that the arrest created uncertainty in the market about the future. The Chinese side will not stir up trouble, but it does not fear trouble, and no one should underestimate China’s confidence, will and strength. As soon as it learned of the situation, the Chinese side entered into stern negotiations (严正交涉), voicing its hard line, and it immediately extended diplomatic assistance to the person involved. On December 8, China urgently called in Canadian Ambassador to China John McCallum, raising stern negotiations and expressing fierce opposition to the arrest by the Canadian side of a Huawei executive. The Chinese side fiercely pressed the Canadian side to immediately release the arrested person, conscientiously protecting their legal and reasonable rights. Otherwise, there would be serious consequences, and Canada would have take full responsibility for these. The Canadian side must think clearly. Between justice and shamelessness there is no grey area. The only way to avoid paying a much heavier price is for the Canadian side to correct this error, immediately desisting from this violation of the legal and reasonable rights of the Chinese citizen, giving the Chinese people the explanation they deserve. David Bandurski is co-director of the China Media Project, and editor of the project’s website. He is the author of Dragons in Diamond Village (Penguin), a book of reportage about urbanisation and social activism in China, and co-editor of Investigative Journalism in China (HKU Press).